I chanced upon these books at Booksale early this year when SM Megamall was having a mall-wide sale. I fell in love with the titles and the illustrations, and I thought they were perfect for my little boy. I bought each Mr. Men book for only Php15.00, and because they were so cheap, I was inclined to buy a lot. Unfortunately, there were only a few titles available then. Mr. Men is a series of children’s books written by Roger Hargreaves. The Mr. Men series started in 1971. The characters in the books have personalities and physical characteristics based on their names. For example, Mr. Funny is a funny character who lives in a funny house, does funny things and drives a funny car. 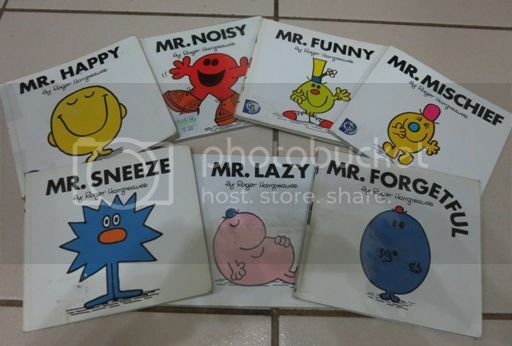 Currently, my son has 7 Mr. Men books, namely: Mr. Happy, Mr. Forgetful, Mr. Sneeze, Mr. Mischief, Mr. Lazy, Mr. Noisy and Mr. Funny. I love reading these books to my son at bedtime, and he loves listening to these stories. My son likes the colorful characters and their stories, and I like the moral lessons conveyed in the stories. I intend to buy the entire set of Mr. Men books for my boy, that is, if Booksale has new Mr. Men books right now. There is also a “Little Miss” series for young girls, by the way. This entry was posted in Booksale, Children's Books, Mr. Forgetful, Mr. Funny, Mr. Happy, Mr. Lazy, Mr. Men, Mr. Mischief, Mr. Noisy, Mr. Sneeze. Bookmark the permalink. I love this series! But it’s the Little Miss ones for me :). They’re a hit in the library I used to work for. i love the characters as well. i call my son Mr.Crybaby and my daughter, Little Miss Bossy! I love Mr. Men! but I seldom see them for sale. We used to have a towel that is printed with Mr. Men characters. Great Find, Tetcha! I haven’t seen this yet. I bet my daughter will find the Little Miss series interesting so I’ll look into this. I am not aware of MR. MEN books. I have two littles, (not actually little) but they are not little men, but girls.. I’m sure they will also like the books with cute title. Interesting books! I saw this once or twice in the bookstore. I’ll make sure to buy at least one next time I see it. Daughter would probably like it.